Reaching and engaging your customers through social media is just one of the many benefits of a social media marketing campaign. However, over the last several years, social media websites have seen a huge growth in visitors, so how do you know which sites to utilize? 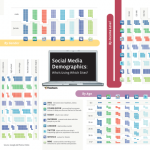 Thankfully, the social media demographics infograph helps make that decision easier with information detailing which site attracts the most educated users, which sites attract the users with the most income, or which site is popular amongst different age groups. Be sure to visit the TopRank Marketing News Blog on a regular basis for tips, case studies and news on upcoming events.